Researchers at Idaho National Laboratory have discovered how to make "superalloys" even more super, extending useful life by thousands of hours. The discovery could improve materials performance for electrical generators and nuclear reactors. The key is to heat and cool the superalloy in a specific way. That creates a microstructure within the material that can withstand high heat more than six times longer than an untreated counterpart. "We came up with a way to make a superalloy that is much more resistant to heat-related failures. This could be useful in electricity generators and elsewhere," said Subhashish Meher, an INL materials scientist. He was lead author of a new Science Advances paper describing the research. Alloys are combinations of two or more metallic elements. Superalloys are exceptionally strong and offer other significantly improved characteristics due to the addition of trace amounts of cobalt, ruthenium, rhenium or other elements to a base metal. Understanding how to build an improved superalloy is important for making the metallic mixture better for a particular purpose. 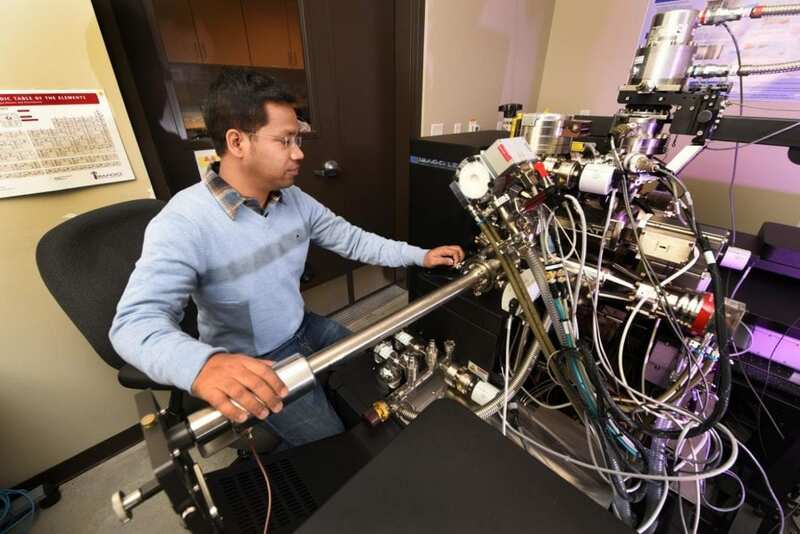 INL scientists have been studying nickel-based superalloys. Since these superalloys can withstand high heat and extreme mechanical forces, they are useful for electricity-generating turbines and high-temperature nuclear reactor components. Previous research had shown that performance can be improved if the material structure of the superalloy repeats in some way from very small sizes to very large, like a box within a box within a box. This is called a hierarchical microstructure. In a superalloy, it consists of a metallic matrix with precipitates, regions where the composition of the mixture differs from the rest of the metal. Embedded within the precipitates are still finer-scale particles that are the same composition as the matrix outside the precipitates – conceptually like nested boxes. Meher and his coauthors studied how these precipitates formed within a superalloy. They also investigated how this structure stood up to heat and other treatments. They found that with the right recipe of heating and cooling, they could make the precipitates two or more times larger than would be the case otherwise, thereby creating the desired microstructure. These larger precipitates lasted longer when subjected to extreme heat. Moreover, computer simulation studies suggest that the superalloy can resist heat-induced failure for 20,000 hours, compared to about 3,000 hours normally. One application could be electrical generators that last much longer because the superalloy that they are constructed of would be tougher. What's more, INL scientists may now be able to come up with a procedure that can be applied to other superalloys. So, it may be possible to adjust a superalloy's strength, heat tolerance or other properties to enhance its use in a particular application. "We are now better able to dial in properties and improve material performance," Meher said. The research appeared Nov. 16 in Science Advances, "The origin and stability of nanostructural hierarchy in crystalline solids." INL is one of the U.S. Department of Energy's national laboratories. The laboratory performs work in each of DOE's strategic goal areas: energy, national security, science and environment. INL is the nation's leading center for nuclear energy research and development. Day-to-day management and operation of the laboratory is the responsibility of Battelle Energy Alliance. See more INL news at http://www.inl.gov. Follow @INL on Twitter or visit our Facebook page at http://www.facebook.com/IdahoNationalLaboratory.